Ivybridge Flotation Bed Group with Fast Free Shipping! 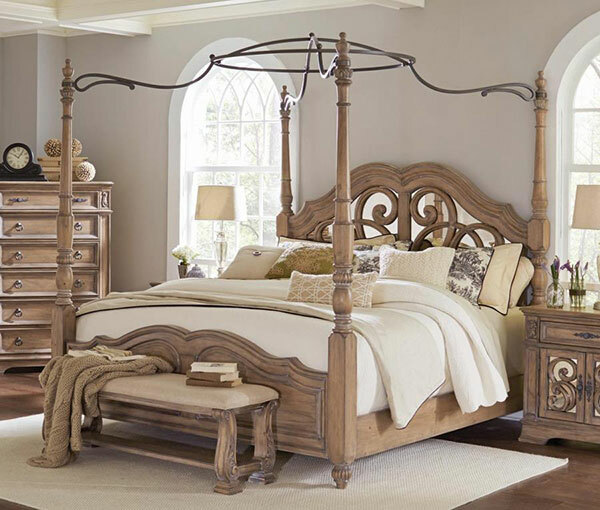 Make a statement with the Ivybridge canopy poster bed featuring exquisitely carved scrolls over antique mirrors. The flotation system includes: bed, mattress and foundation. Matching furniture available. 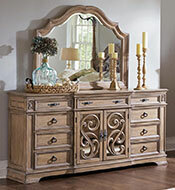 The Ivybridge collection highlights traditionally-styled furnishings with a glamorous flair. 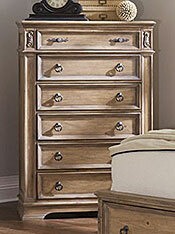 Elegantly crafted, the matching pieces feature English dovetail drawers with full extension glides, turned legs, antique brass handle hardware, felt-lined top drawers, and intricate design accents. The Ivybridge Flotation System includes: Canopy Poster Bed, 8" deep plush-top soft side mattress and 9" foundation for a complete modern flotation system. Available in Queen, King and Cal. King sizes. Make a statement with the Ivybridge canopy poster bed featuring exquisitely carved scrolls over antique mirrors. The flotation system includes: bed, mattress & foundation. Matching furniture available. 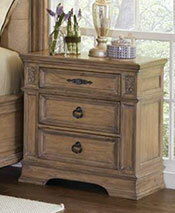 Matching 1Drawer Night Stand with Mirrored Storage Doors for Innsbrook and Ivybridge Collections. 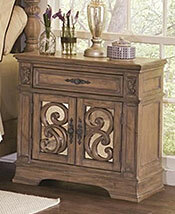 Matching 3 Drawer Night Stand for Innsbrook and Ivybridge Collections. Matching 9 Drawer Dresser for Innsbrook and Ivybridge flotation collections. Matching Bench for Innsbrook and Ivybridge. Collections.